Oh finally I had some vongole (clams) sizzling in my saucepan. 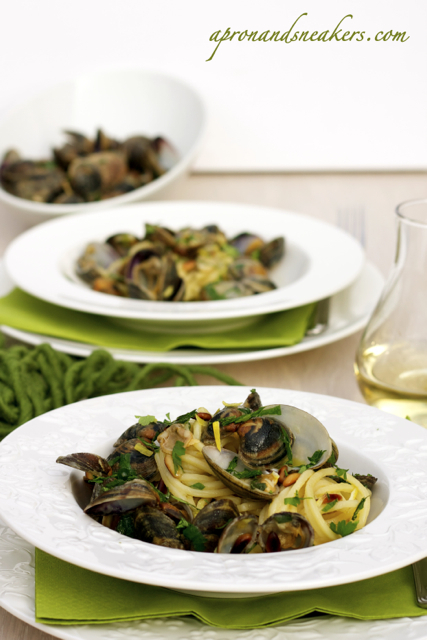 After I watched a cooking demonstration of this recipe in Gambero Rosso, an Italian cooking channel, my quest to prepare this recipe intensified because I couldn't find the vongole. Where were they all off to these past weeks? I didn't even think to find out if they are seasonal. Are they? 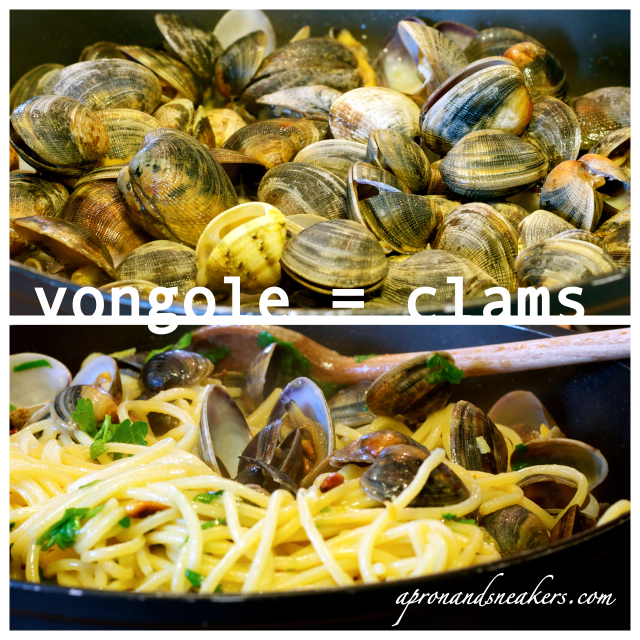 The vongole come in two species in Italy. The vongole veraci (Ruditapes decussatus) or carpet shell clams and vongole filippine (Tapes philippinarum) or Philippine clams that were introduced in the waters of Venice in the 80's. The first time I learned about this, I was surprised how they came to live in the Italian waters. 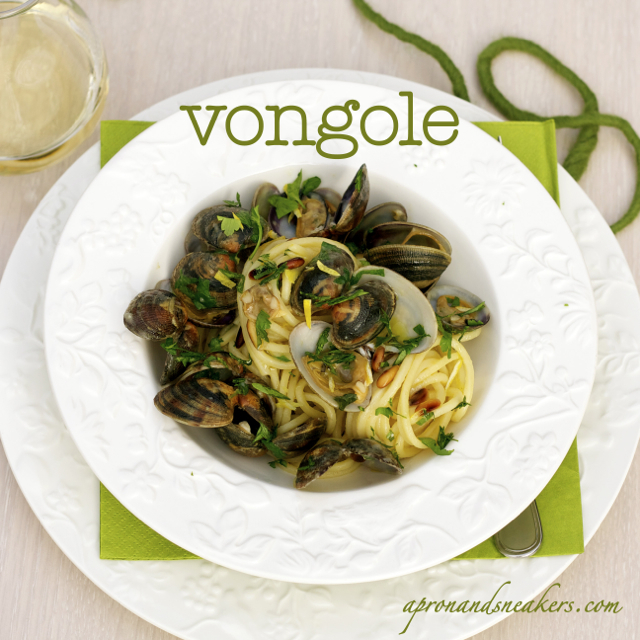 They are less favored than the vongole veraci because they are less tender and less tastier. Maybe for that reason, the spaghetti con le vongole that I cooked in the Philippines a few years ago tasted milder in contrast with the one I usually cook in Italy. When one ingredient changes, everything else is affected. This is still the classic version but with a little twist of lemon, pine nuts and toasted crumbs of savory taralli. And the cooking procedure is slightly different from how I usually do it. From the original recipe that I watched, I tweaked here and there to adapt to our tastes. 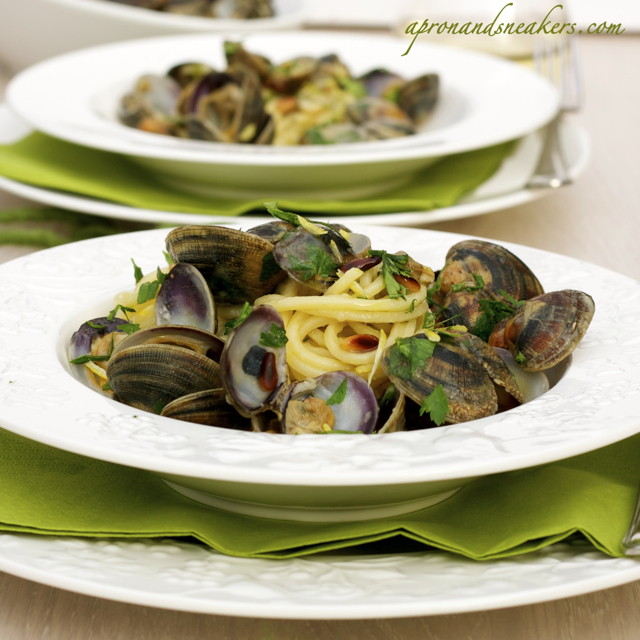 It was a welcoming change from the usual classic spaghetti con le vongole that I usually prepare. What made it more pleasant was the subtle and lingering taste of lemon. It was refreshing and made the dish more delicate. The pine nuts added more nutty substance, a bit strong in counterpoint with its translucency. Whereas for the toasted taralli crumbs, my husband and I had almost congruent thoughts. We both didn't like it at the first taste. It's best to keep them separated and just sample a little at the beginning because you may or may not like it. My husband was persistent in understanding if he liked it or not that he kept on sprinkling the crumbs in alternate forkfuls. After an empty dish, he was still ambivalent. 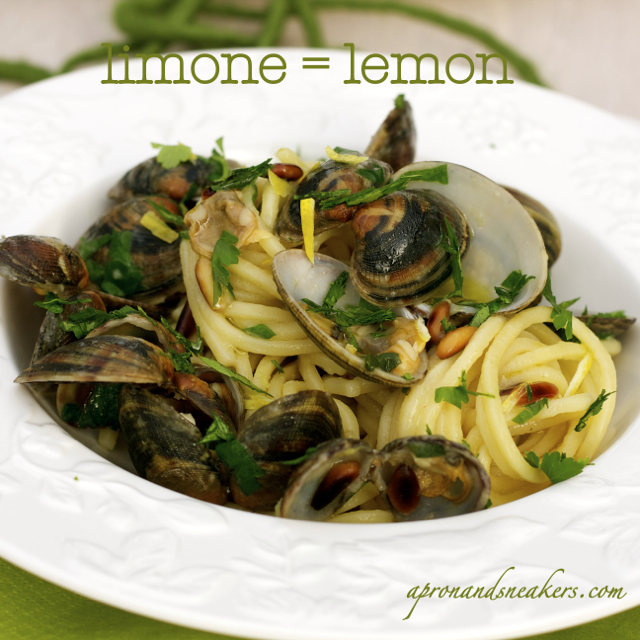 I really preferred the lingering blending of the lemon & vongole without the taralli because it dominated the flavors. 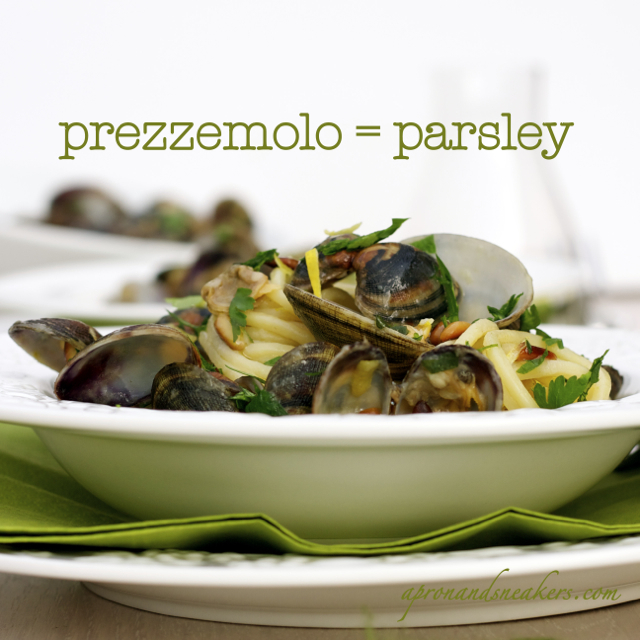 Wouldn't it be fun to learn some Italian culinary words together? I'm no expert in the language because I am taking a turtle's pace in learning. This is my third language and I feel stuck in learning it. It's too hard and maybe my brain can accommodate only two languages? Sigh. My kids ONLY speak in Italian even if I continuously and painstakingly speak with them in English from the day they were both born. Sofia, at 2, is still betwixt and between English and Italian. Riccardo, on the other hand, seems to have professed his solidarity with his Italian. No amount of coercing can bend it. Even if I'm caught balancing in between languages and cultures, I make sure that this balancing act affects my kitchen to a positive nature. I take it as a limitless gastronomy without borders. The more, the merrier, isn't it? I have fun cooking both diverse cuisines and introducing my family to a kind of cooking that they don't get anywhere but from our very own kitchen. I hope you enjoy this dish just like we did! Boil some water for the pasta in a pot. In a small saucepan, toast the pine nuts. Toss until they change color. Set aside. In the same pan, sautè 1 crushed garlic (without oil) and the crumbs of the taralli. Toast. Keep on moving the pan to avoid burning. Set aside when toasted. Still in the same pan, put a teaspoon of extra virgin olive oil and cook lemon rind in it for 1 - 2 minutes. Set aside. Using a big saucepan this time, sautè 2 cloves of crushed garlic and chopped chili with hot extra virgin olive oil. When they color, add the clams. After about 5 minutes, with a high flame, add the white wine. Let it evaporate before putting it back to medium. Cook until all the clams are open and cooked through. Discard the ones that didn't open. 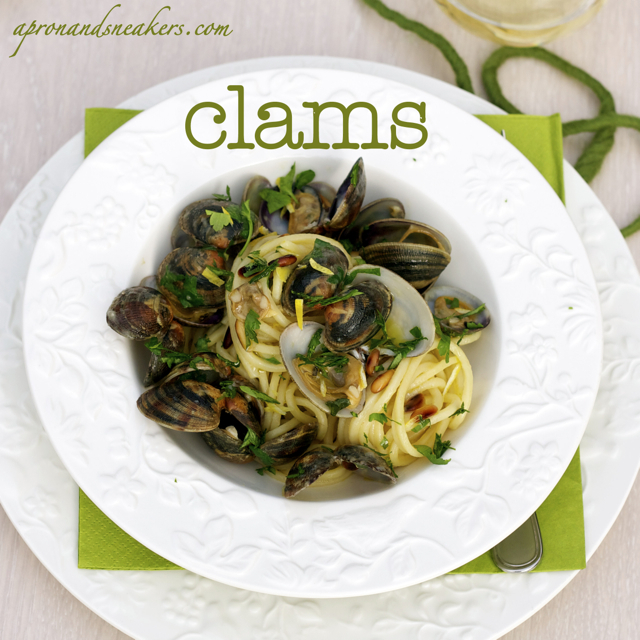 Transfer the open clams to a bowl, leaving the liquid in the saucepan. When the water for the pasta boils, add some salt. Cook the pasta only at halftime. If it's for 10 minutes, transfer them to the saucepan with the clam liquid after 5 minutes while still half-cooked. Keep on mixing the spaghetti so that they can absorb the liquid in the pan. If the sauce is drying up, ladle some hot water from where the pasta was cooked. When the pasta is is almost cooked, add the parsley, lemon rind and pine nuts. Then mix in the clams. Cook together for a minute. Turn off the fire. Drizzle with extra virgin olive oil & sprinkle with pepper. Don't use salt because the water of the pasta and the clams are already salty. Serve hot with the taralli crumbs on the side.